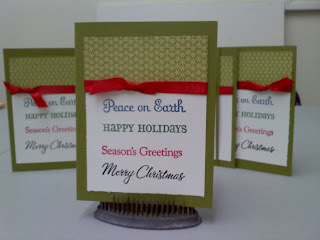 I got a few cards out in this design, using the Merry Moments DSP and Old Olive CS with a few different color inks. Simply pop on some red ribbon and you are done! They are light and wont cost extra to mail this year! I cannot believe its been so long since I last posted. I have started about 100 times, but this time, with coffee in hand, and phone off hook, I managed to complete it! HOORAY!! !